What is Bitcoin freeroll and how can you play with it? The latest craze among poker players is to play poker with Bitcoins. 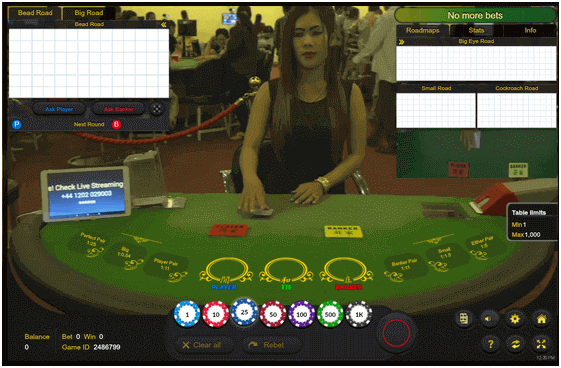 You can play bitcoin poker against real players online whenever and wherever you want. As deposit and getting the wins back is easy with Bitcoins you have also complete anonymity without worrying about the regulation or the laws to play poker or not. Bitcoin Poker freerolls is one of the most used promotional tools in online poker, both to acquire new players and reward existing. Ever since online poker was created freerolls have existed as a way to attract players to a site, offering a added prize pool to a free tournament. Today freerolls are not only used to attract new players, but just as much to provide extra value for loyal players, giving them the chance to win some extra free money for playing on a site. Also a free roll poker tournament is one excellent way to win bitcoins without having to give your own money. The good thing is you do not need to make a BTC deposit right away. Just sign up and you can already play. There are different types of poker free rolls where you can choose to play. Almost all bitcoin poker sites offer online freerolls. The competition differs with the varieties of freerolls. While some offer bigger stakes, they are difficult to beat. Professional poker players are not attracted to these types of poker tournaments because the stakes are not big enough for them to spend two hours of their time. 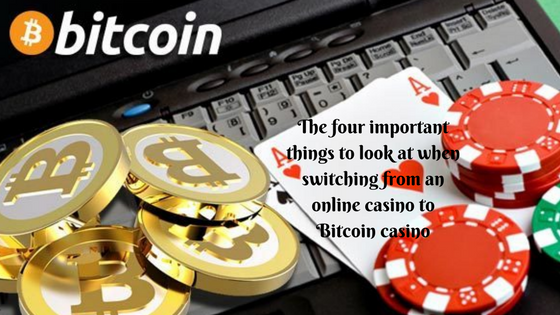 You can experience online BTC poker game without shelling out your own bitcoins. How to get Bitcoin freerolls? Almost all Bitcoin poker sites offers freerolls to their players, but most freeroll tournaments have some sort of requirement before being able to participate. This can be everything from being tracked to the right affiliate, have enough raked hands, having done a deposit within the last 30 days or depend on which VIP level you are. Usually the higher the prize pool is, the more requirements are attached to the freeroll. Many online poker sites do however still offer small prize freerolls which, depending on the site, runs hourly, daily, weekly or monthly. How does Bitcoin freeroll work? As said above Freerolls are basically a tournament that is free to participate in, with an added prize pool from the poker site. The freeroll will then pay the players that ends in the payouts with everything from Bitcoins to tournament buy-ins. Depending on what type of freeroll it is, the value added to the tournament can very small but also very high. 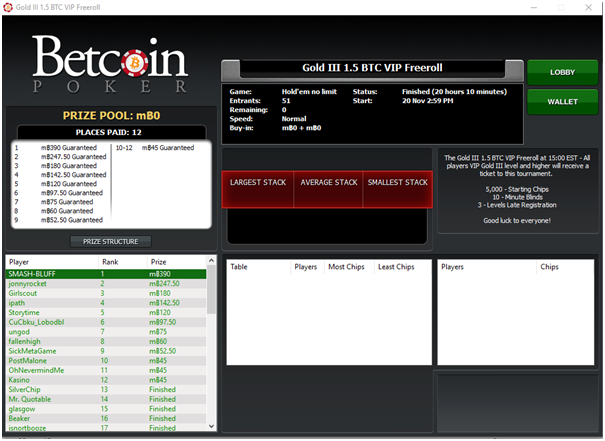 Many online poker sites have monthly freerolls for all their VIP levels, with 0.001 Bitcoin to 1 Bitcoin added in prizes. This means that loyalty can be rewarded well by many sites and provide players with a chance to win a huge amount of Bitcoins for free. While the buy-in for a freeroll is always free, some freeroll tournaments allows you to re-buy if you are busting out and also to do an add-on in the break to have a bigger chip stack. 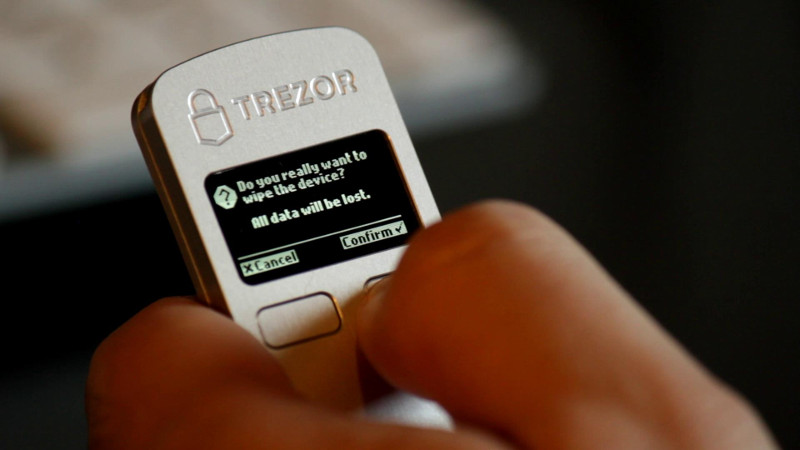 This means that even though the freeroll might be free to play, you can in some cases spend Bitcoins on improving your chances of winning the prizes. The Bitcoins that players use to re-buy or purchase an add-on will almost always be added to the total prize pool, making the freeroll even more valuable. When you register for a freeroll, remember to check if it is with re-buy and add-ons before the tournament starts, so you know if players will play crazy or normal and also so you have a chance to deposit some Bitcoins into the account to play, if you haven’t already got Bitcoins there. How can you take part in a Bitcoin freeroll? Check whether freerolls are locked to any specific type of players- As many online poker site allot free rolls to certain VIP level of players or to new players or for players of a specific affiliate only. When you have checked that, you will either have to fulfill the requirement to participate or if there are no requirements, you can simply just register. Check whether you would have to play a certain amount of raked hands, before being eligible to participate in the freeroll. This means that only players that have been active on the cash game tables of the site will be able to enter in the freeroll, everybody else is locked out. This can easily be solved by playing some cash games on the site and reach the target to become eligible to participate. In some cases it is not worth the trouble to reach the different requirements to play a freeroll, as it would take too much time to reach them to be able to win for example $10. But in many cases it can work out well if you find the sites with the best freerolls and stick to playing on them, as they will reward your loyalty with the chance to win even more free money, tournament tickets and gadgets. Where to find freerolls to play? You can easily find freerolls to play on the biggest Bitcoin poker sites, as they are shown in a special “Freeroll” tab in the poker client. 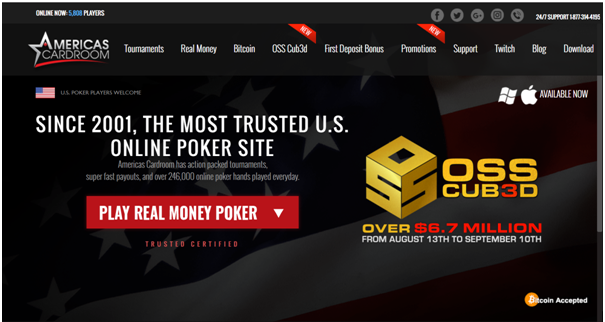 You can find wonderful freerolls to play at Americas Cardroom that offers Bitcoin Poker. 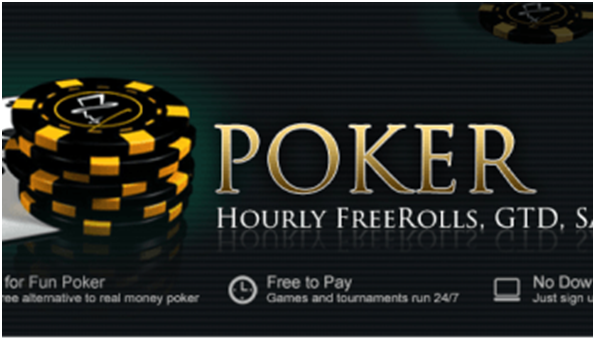 Here freeroll tournaments are available at any time of the day and week. 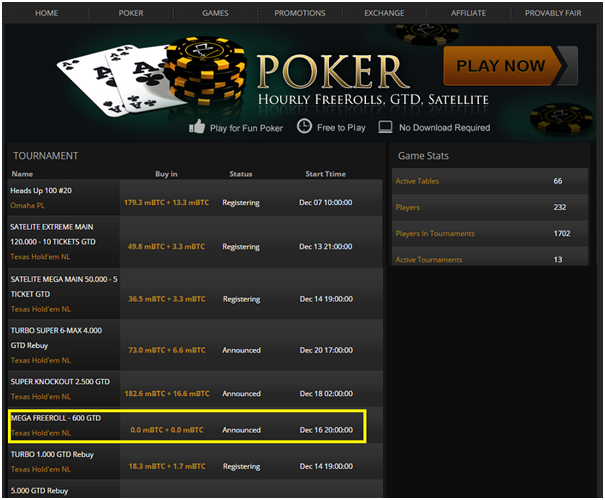 Known as Freerolls on Demand they do not have any schedule as to when they will begin. Instead, the free tournaments only start when 270 players register for it. There is a ‘late registration’ period of 30 minutes for every tournament to ensure more people can join. For one week, players can accumulate points by joining the top 10 players of a tournament. The 10 players who can collect the most points will win a free entry to Americas Cardroom Sit & Crush tournament. The first placer will get a free shot at the Sunday tournament. The buy-in for this type of tournament is $215. The other good site is Betcoin.ag and follows the same freeroll tournament format as Americas Cardroom. More than 200 players play against one another to gather points throughout the duration of the tournament. The top 10 or five players who are able to get the most points win the prize pool. The prize is often fiat cash or Bitcoin. The highest placers will receive a majority of the prize. Betcoin.ag also has special freeroll tournaments that require a password before a player can register for it. Players can find these passwords through Betcoin’s newsletters or a third-party website. These special tournaments often have a higher prize pool than normal. 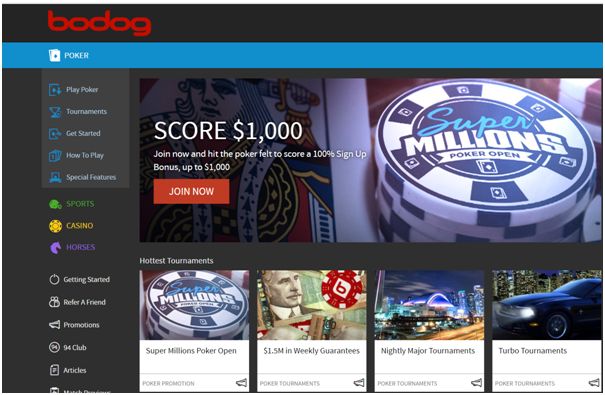 Another online site is Bodog where you get many freerolls to join.Its free-for-all tournament does not have any requirement for players to join. Though other tournaments usually require players to gain points from betting with cash or by reaching a certain VIP level for their profile. Making a deposit might provide a player with a free entry to a promotional freeroll tournament. Also you can play at Redstar online poker site. To participate in any of Red Star’s freerolls, you need to have a bank account. You do not need to send in a deposit from the account. The freerolls from Red Star have a higher prize pool than other poker sites. Certain freerolls tournaments may require players to play in a paid poker game a number of times before they can register for them. 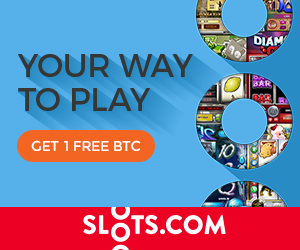 There are other freerolls BTC sites like Seals with Club and Betcoin poker where you can enjoy these games with Bitcoin. As freerolls are used a lot as a marketing tool to acquire new players or as added value to loyal customers, you will always be able to get other bonuses when you play freerolls. The online BTC casinos that hosts the freerolls to retain you as a player for BTC freeroll provide other bonuses like rakeback, VIP, Cashback system, promos and much more. Even though the returns of freerolls might be small compared to the time you are spending on playing them, you will be able to learn poker for free and even make some Bitcoins to help your bankroll increase. Now just choose the online site offering freerolls BTC and begin the show.